Will His praise always be on your lips? Praise and Worship are some of the ways we let God know just how much we love Him. They allow us an intimate and/or collective way of expressing thanksgiving, admiration and adoration to our Heavenly Father and Jesus our Savior. And let’s not forget that there is power in worship. We see one example of this in 2Chronicles 20:22 NIV22 As they began to sing and praise, the Lord set ambushes against the men of Ammon and Moab and Mount Seir who were invading Judah, and they were defeated. God actually intervened and rescued His people from their enemies when they praised and worshiped Him. The word of God says that God even inhabits the praises of His people as we see in Psalm 22:3 KJV3 But thou art holy, O thou that inhabitest the praises of Israel. Ephesians 5:19,20 NIV 19 Speaking to one another with psalms, hymns, and songs from the Spirit. Sing and make music from your heart to the Lord, 20 always giving thanks to God the Father for everything, in the name of our Lord Jesus Christ. Psalm 9:11 NIV 11 Sing the praises of the Lord, enthroned in Zion; proclaim among the nations what he has done. Psalm 150:4 NIV 4 Praise Him with timbrel and dancing, praise Him with the strings and pipe. Psalm 47:1 NIV 1 Clap your hands, all you nations; shout to God with cries of joy. 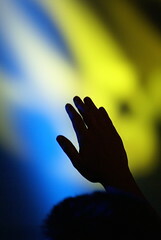 Psalm 134:2 NIV 2 Lift up your hands in the sanctuary and praise the Lord. If you are a follower of Christ, you have every reason to worship and praise the Lord regardless of your current circumstances. He has redeemed you and set you free from a life sentence! He has and will transform your life from something broken to something beautiful! He is the faithful ONE that you can always count on! If you need reinforcements in your walk, take the time to praise and worship the King of Kings. Just as God set ambushes against the men of Ammon and Moab and Mount Seir who were invading Judah, and they were defeated, as they began to sing and praise, we can give Him the opportunity to show Himself in our lives when we take our eyes off our difficulties and circumstances and instead turn our eyes and hearts to Him in praise and worship! Praise and worship is not just something we do when our lives are running smoothly, we are to enter into praise and worship despite our circumstances! Instead of grumbling to yourself or others, turn to the ONE that can actually change things. The ONE that intercedes on our behalf! Remember the words of David (a man after God’s own heart) from Psalm 34:1 NIV 1 I will extol the Lord at all times; His praise will always be on my lips. Great post, I said the same thing in one of my posts just in different ways. (Haven’t published it yet). “Will His praise always be on your lips? engaging and insightful! In the present day society that is difficult to achieve.